Finding a place to safely hike in February is not an easy thing. Unless you live in New Zealand, that is. But I'm in Europe and my options are limited. The Big 40 Birthday Gift! Two things coincided: my school is going on winter break and my 40th birthday is on February the 9th. I wanted to give myself a seriously great gift! And what a better gift than two weeks of solo hiking in a warmer place than my own? Using my list of 7 things to consider when planning a hike, I found the perfect destination: a section from the GR1: Spain's Sendero Histórico. What is Sendero Histórico and why choose it? 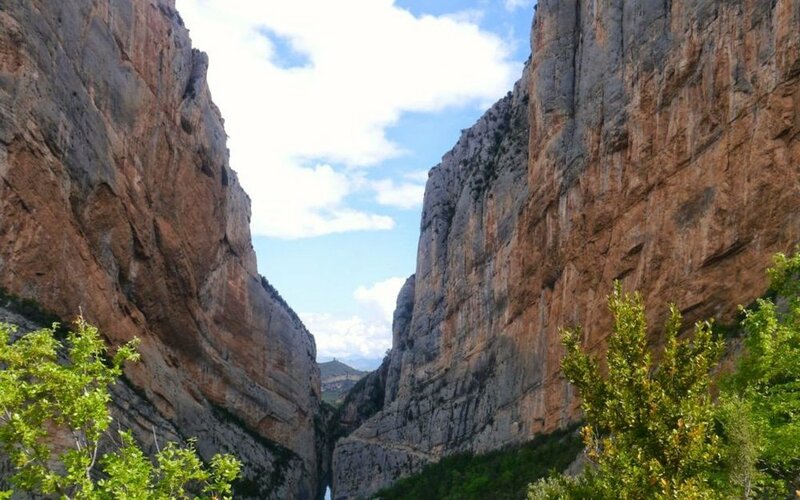 The whole trail spreads over 1250 km, from northern Puerto de Tarna in the province of Leon all the way to the Mediterranean Sea, near L'Escala in Catalonia. It leads along the foothills of the Pyrenees providing stunning views but without the elevation (and low temperatures). It is pretty easy to get to it from Barcelona where I fly to. In February the weather there should be mild – maybe around 10 – 15° C with the temperatures dropping down not more than to 0° C.
It is not very popular and there should be no issues with me camping wild. Every two nights or so I could go down to sleep at an organized camping site or at a small hotel to refresh and wash my clothes. The accommodation along the trail is not perfect, but available, even if you plan on only sleeping at hotels and such. There is very little road walk – most of the trail uses ancient paths connecting villages, most of which are now abandoned. In addition to stunning views and beautiful nature, there is a rich historical content along this trail: abandoned villages, old churches, and castles, towers, and huts. John Hayes, the author of this guide: Spain's Sender Histórico: The GR1 Northern Spain - Picos to the Mediterranean I got for my kindle, divides the whole trail into seven sections. I got particularly interested in section number six from Graus in Aragon. It seemed the most dramatic with spectacular views. According to Hayes, it takes eleven days to go through it. I plan on having 14 days, so I figured I can start a bit earlier, in section five. At one time John Hayes went back and redid a smaller section of the Sendero Histórico. He started at the Red Cliffs of Riglos and walked for fifteen days to L'Espunyola. I decided to simply go a very similar route to the one he chose. If you are somewhere for the first time, it’s a pretty good idea to base your decisions on someone else’s experience and knowledge. Although I was in Spain before, never in this area. After checking the local buses and trains and reading carefully his descriptions of the trail, I settled on starting my hike in Arguis, where I can get to from Barcelona in about 5h by two buses (with a short stop in Huesca). John Hayes was spending his nights only in hotels and so his division of the trail depends on access to accommodation. Hiking with my tent will give me more freedom to walk in my own tempo. One of his sections is almost 40 km long – he was able to do it, but I know I can do maximum 25 km a day with a full backpack. I aim at 15 – 20 km a day, depending on the terrain. I have less than two months before my flight to Spain, so I started a little training – I stopped using an elevator and only take stairs to go up and down. My apartment is on a 13th floor, so it’s not a small walk up! I probably should add more exercise to strengthen my legs, though. I still need a new sleeping bag and some small items. But most of the gear I am planning on using is exactly the same as I had in Scotland. It is not the lightest, but it’s good and I was happy with it. I have a good budget tent weighing only 2kg. I was particularly happy with my boots, which I plan on taking with me. I am not ready for ultralight hiking in trail runners. My backpack, although not the lightest, provides great support for heavy loads and long treks, so I'm not looking to replacing it anytime soon. I love my camera, which is great as that's one of the more expensive items. I have my packing list basically ready. It's getting exciting! Just look at those photos! They make me truly excited for the trip!